This conference was held in Canberra over the week-end 28-30 September, organised by our society with the full support of the Italian Embassy. 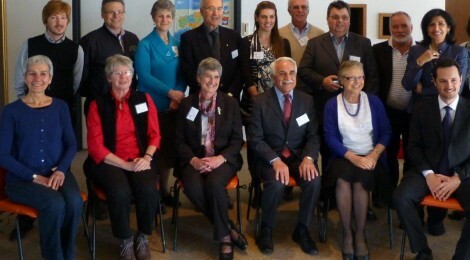 There were representatives from six Societies: Sydney, Melbourne, Brisbane, Adelaide, Perth and Canberra. On Friday 28 the ten interstate visitors met with Dante Committee members and other guests for the official welcoming reception and buffet dinner at the residence of the Italian ambassador. The host was Alessandro Giovine, First Secretary at the Embassy – the ambassador being overseas at the time. On Sat 29 the proceedings took place at the Italian Embassy. Apart from the interstate representatives, there were also some 12-15 local people including Dante President Franco Papandrea, Vice-President Sue Hancock, Treasurer Mario Rosi, Committee members Francesca and Franco Foppoli, Cellina Benassi, Orlando Di Iulio, Vittorio Beltracchi and myself as vice-president; teacher Pauline Adams and conversation leader Giuseppe Parisi; teacher of Italian at the Yarralumla Bilingual School Meri Dragicevic; the ANU’s Piera Carroli for a short time; the Canberra Convenor of the Languages Forum Mandy Scott; and Alessandro Giovine. The morning session was dedicated to the presentation of their activities by each Society. What we learnt was that each one of us operates in a different way: although we all have the same overriding goal of promoting Italian language and culture, our activities are determined by the environment in which we operate (eg whether there are other organisations offering Italian language courses or cultural events; whether there are universities with which to run collaborative activities; whether we have access to a significant number of young people etc). So, for instance, in Mebourne there are no formal classes but there are conversation classes to assist Yr 12 students, and the Society focuses on literary competitions among school students at all levels as well as cultural events, and a young person on the committee has made strong links with GIA – she organises successful social evenings attracting 100-200 young people; in Sydney the Italian language classes are successful but there is limited focus on cultural events given that so many are already organised by other organisations; in Brisbane teaching activities have been maintained despite a series of negative events (two floods and then loss of premises) that have thwarted other plans; in Adelaide language classes have started and a successful event around cinema (Cineforum) run jointly with the universities is held regularly; Perth too runs classes as well as cultural events such as a successful theatre night during Italian Language Week. I presented the report on our activities with which you are already familiar. The afternoon was mostly taken up by a round-table discussion that centred on similarities and differences, shared goals and common issues (eg lack of Italian government funding) and pros and cons of nominating a spokesperson to speak on behalf of all the societies if the need to present a strong united front arises (eg threats to the teaching of Italian at schools or universities in Australia). There was general agreement that it would be advantageous to have such a spokesperson and that it should be the president of the committee charged with the responsibility of organising the next biennial conference. In this case, Dominic Barbaro, president of the Melbourne Dante, offered to organise the next conference and will therefore be the spokesman for all the committees on major issues. During the morning there was an entertaining and instructive talk on Dante given by Mario Serenellini. He spoke of Dante’s life, career and literary works – not just the Divine Comedy. He then focussed on Dante’s treatment of love, and recited the canto in which Francesca da Rimini explains how her love for Paolo was born. The afternoon started with a fascinating in-depth analysis by Concetta Perna of the coverage of Italy and Italians by the international media, ie what was the image of Italy portrayed outside the country. Concetta traced the positive coverage in the 50s (Vespa, Cinquecento) and 60s (Stile Italiano), the negative coverage in the 70s (Red Brigades) and the shift to positive again in the 80s (fashion, quality products at expositions) only to return to the negative treatment from the 90s due to a focus on corruption, organised crime, tax evasion, bureaucratic inefficiency, economic crisis, Berlusconi. Concetta stressed that to counter this negative focus, there continues to be much attention devoted to lifestyle, culture, the Made in Italy, artistic heritage and beautiful landscapes. Special thanks go to our devoted long-term member Catharina Koopman who, with the assistance of Sue Hancock, assumed full responsibility for the catering arrangements for the Saturday at the embassy and for arranging the conference dinner at the Yarralumla Yacht Club. Catering arrangements were extremely smooth and everyone appreciated the good food, coffee and tea as well as the cakes and biscuits baked by Cellina Benassi and Catharina herself. Another thank-you goes to the Dante Musica Viva choir that came during the lunch break to give guests from out of town a taste of its musical skills – real home-grown entertainment (we are after all the only Dante with a choir!). Mario Rosi also deserves praise for his very attractive design of the conference program. And last but not least a big thank-you to Alessandro Giovine for his warm hospitality on Friday evening at the ambassador’s residence and on Saturday at the Embassy.